An urban park specifically designed for the quiet, the relaxation and the coolness in the middle of the city. The garden enlarges constantly to offer more and more green spaces where the water is in good place. 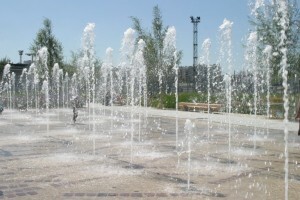 For kids (and adults) funny, sound and visual water games as well as some water columns that goes up to 5-meter-high are to be discovered. Walkers will appreciate to go green for a day : gardens, playgrounds, sports fields, woody area and “green beach” for sunbathing amateurs. A mandatory visit in Paris : the Eiffel tower ! Moreover the magnificent view at the Trocadero esplanade, get down to the gardens on the edge of the fontaine de Varsovie, you can take advantage of its freshness and admire its sculptures. Bathing is prohibited, nevertheless you can lay down on the lawns and get fresh with the fountain mist. At nightfall, don’t miss the aquatic show in particular during summer, with lighting games near the fountain. 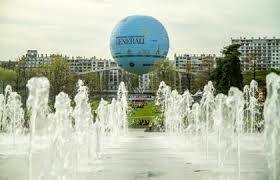 One of the most largest and finest park in Paris with 14 hectares to wander quite freely over the larges lawns and across differents kinds of gardens with beautiful tropical plants and several playgrounds for kids. And what about the freshening side? 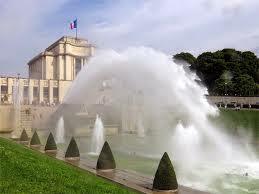 Several water jets that spring on the mall regularly and 120 water games all along the lawns up to the Seine. An ideal place for the whole family to recharge and to picnic on the grass. I went into this café by chance, to get a quick coffee…From outside, not a specifically family-friendly place… but I started changing my mind when I saw a highchair put aside and found out there was a changing table in the ladie’s room. – as already described highchair and changing facilities are available for babies. 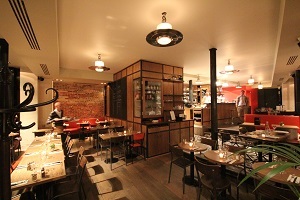 For all menu offers various burgers and French brasserie dishes (rib steak, duck filet, fish, home made dessert, crepes…). And when the tenant who simply explained me: “we have children ourselves, we just wanted to ensure they would feel comfortable here, and welcome families like they should be anywhere”… I can only say “yes!” and recommend it!